Hydraulic dog grooming tables are tables used to safely keep dogs in position during the groomer’s routine on the dog. The hydraulic pump is used to automatically adjust the tabletop height level. Hydraulic grooming tables for dogs are designed with special features that help prevent your dogs from running away or falling (e.g. non-skid surface top, H-arm, etc). These tables are great for both home and salon use but are generally preferred by professional groomers. Hydraulic tables have the ability to last a lifetime so there’s no concern for regular replacements. Additionally, their supreme sturdiness, as well as the fact that they are compatible for larger sized dogs, provide a more diverse opportunity to accommodate the needs of any dog breed. Every dog owner who grooms their pet at home and any dog grooming salon that cares about quality and efficiency should be equipped with the best grooming tools. In terms of grooming tables, there is nothing better. 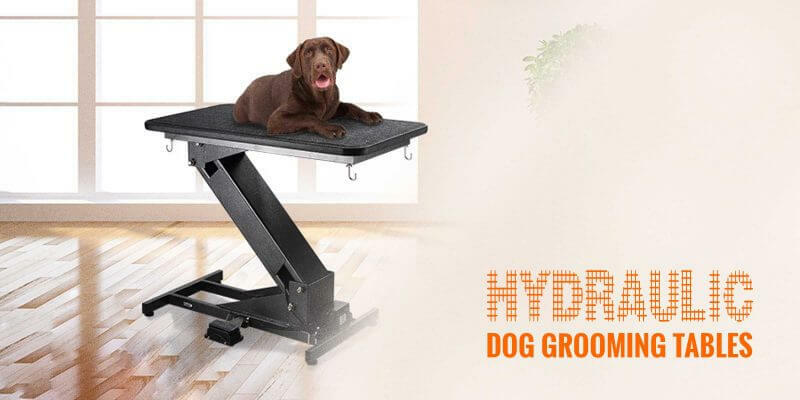 Besides mobile and foldable grooming tables, there is the option of using a hydraulic dog grooming table or an electric grooming table. Each with its own unique purpose depending on your individual needs. The main difference between an electric table and a hydraulic table is the way in which it functions to operate the table adjustment. An electric grooming table uses an electric motor mechanism to lift the table top, whereas a hydraulic grooming table uses a pump operated by the user’s foot. An electric table is operated by a push of a button, and a hydraulic table uses the physical body as leverage. The decision to choose one table from the other is a personal one. Both are equally qualified for professional use and both tables are available with wheels for portability as well as fixed feet for more sturdiness. To note, hydraulic systems are more expensive than electric grooming tables. Because hydraulic grooming tables are very pricey products within a professional grooming kit, buyers must understand what features to focus on before buying. We are reviewing the most important features below and then recommend the hydraulic tables we prefer. 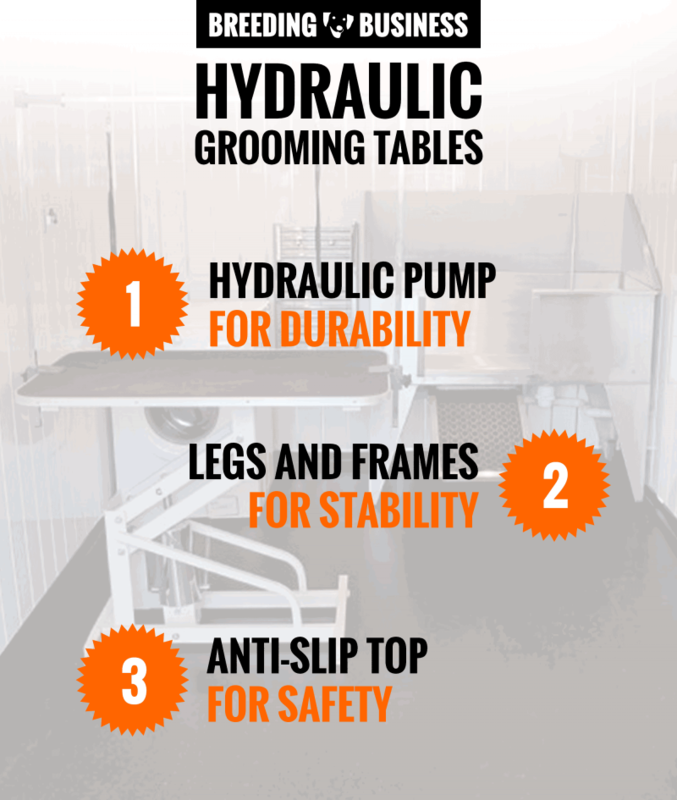 Professional groomers and pet grooming salons favor hydraulic tables over electric ones for their comfort, durability, and quality of manufacturing. The hydraulic pump is the main feature of any hydraulic table, it is its backbone. A hydraulic pump is a mechanism specifically responsible for the functioning of the table movement, handling the going up and down. You want to find a pump with high-quality standing. Pumps are designed to stick around for a long time so their durability tends to be quite tenacious. Make sure you know when it’s time to change your pump. When choosing a hydraulic pump, you have the choice of purchasing a manual pump or one that is solely operated by the foot. Always check with the table’s manufacturer what are the pumps currently compatible with the table you own. Hydraulic tables are generally delivered with a warranty that qualifies as insurance in the case anything were to go wrong with your product. After all, these tables can be quite expensive so always keep your purchase transactions on the safe side. It is important to remain business smart and require a warranty. Indeed, the more one handles a product, the more likely things may go wrong, or get broken. That’s why having a warranty is a must. Features in a hydraulic table are often centered on how well the legs and frames are built and designed. For most standard tables, frame bases tend to be H-shaped and leg frames are designed in a Z-style for easier lifting and lowering that prevents any sudden or erratic movement. These featured components are made to ultimately provide more stability and solidity to the product based on the design of the materials. In most online reviews of standard hydraulic tables, the coating of the paint is not always an immediate concern. However, how the table is coated can help prevent future slippage and give it the ultimate sleek, polished look. Coating helps prevent rust and mildew, as well as other inconvenience due to the years of age. Grooming tables will always be designed with safety in mind and that’s why having a table top that is built with resistance is of optimum importance. You can find many grooming tables on the market that provide anti-skid rubber surfaces to prevent slipping. The table tops are made for maximum traction for personal and professional use with dogs of any sizes. Key features in hydraulic grooming tables for pets. Any quality hydraulic grooming table you find on the market will cost you anywhere between hundreds of dollars up to around a thousand dollars. As expensive as these prices may seem especially to a new buyer, you need to take into consideration what these tables will do for you and your business in the long run. In general, grooming tables of any kind are going to be rather pricey for professional use cases. If you work in a professional setting, such as a salon or other high-end facility, then it’s in your best interest to opt for quality as opposed to seeking lower prices on the market. Look at your grooming table as an investment. The price you pay for a grooming table will actually save you more money in the long run by lasting you a lifetime. This is especially true for someone who is a frequent user, as you’re going to want a table that can withstand the frequency of everyday professional use. Due to this, hydraulic tables are highly recommended for heavy-duty users and professional groomers, as opposed to the user who uses it for personal use every now and then. It’s recommended to purchase these tables on Amazon due to the customer having more control over the transaction. If the product is not as expected, at least you have the option of returning the item and receiving a full refund which is extremely valuable when purchasing premium products. We reviewed and shortlisted these very popular dog grooming table with hydraulic pumps. They are expensive but totally worth the hefty initial investment. These five grooming tables are our favorite picks for anybody looking for a high-quality hydraulic grooming table. They are fit for home use as well as in a professional groomer’s salon. 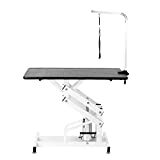 — Best Hydraulic Grooming Table For Salon! 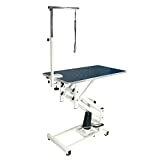 Z-Lift Hydraulic Dog Grooming Table by ComfortGroom is one of the sturdiest tables on the market today. It’s actually the strongest one in the industry according to its manufacturing label, weighing a solid 500 lb. This is the highest weight capacity of tables to date of all tables on the market. The table has an adjustable height that reaches up to 21″ to 39″ utilized by the hydraulic foot pump. The top of the table is removable and lockable which makes it easy for cleaning as well as a replacement. With the great price, the table makes for an incredible investment and worth purchasing as it provides a lifetime warranty for the frame and a one-year warranty for the hydraulic pump. This grooming table made by ComfortGroom is specially designed with a skid-free and high-density board that is waterproof. This makes it easy to clean as the vinyl trim along the table’s surface and pebbled top make it easier to handle for longer periods of time. Extra comfort is added to this table with a foamed underside layer. The table is easy to assemble according to recent buyers with special consideration to the fact that it comes with its own hex key. The customer service for this product also received great reviews. The sturdiness of the table was able to lift up giant dogs, easily lifting a 210lb dog. The only major complaint seems to be due to its pumping mechanism, some users find the electric tables easier on their physical body as it strains less. — Popular Professional Grooming Table! The Groomer’s Table measures 24-inch x 36-inch and its height is adjustable reaching up to 40 inches from 19 inches. The non-slip top measures 24″ x 42″. This grooming table is made in the US and provides much more of a portable option for its buyers due to its smaller size. It’s neatly and creatively designed with a dog paw print logo on its top and bottom displays. In terms of price, it’s a couple of hundreds of dollars pricier than its ComfortGroom counterpart. However, this table comes with a three-year warranty and is delivered to the user fully assembled. This tends to be a very stable and durable table. The design is fit with the professional groomer’s productivity and effectiveness in mind, coming with two separate holes specifically to hold scissors and a clipper blade. These grooming tables by The Groomers are designed to last a lifetime, providing clients with 14-gauge powder-coated steel and a steel-reinforced, textured table top to give groomers a maximum strengthening work product. One just needs to simply press on the pump and lift its height to its desired spot. This product received many highly praised 5-star reviews due to its extreme sturdiness relative to its price and for its textured table top. The roughness of the top’s texture is great for avoiding any slippage with the dogs and keeping them from falling off. The holding holes for tools provided are greatly appreciated giving more room for groomers to move around and keep organized during their routines. Though, some users do not like the roughness saying it makes it much harder to clean compared to other tables and that due to the pedal, scissor cords tend to get wrapped and tangled. — Flying Pig High Quality! This heavy-duty table would definitely be considered a master equipment hydraulic grooming table on today’s market. With a high price tag, it’s still considered a well-worth investment in the long run. 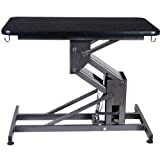 The Flying Pig Hydraulic Table is designed to add unprecedented convenience and comfort for professional groomers. The table measure at 43.5 inches in length and 23.5 inches in width. In addition, it has a lifting range of 19.5 inches to 39.75 inches. The lift, which is operated by the foot in its hydraulic position, allows for an easier and smoother lift adjustment. One of its most praised features, which happens to set it apart from most other tables in the same category, it is bone-patterned, rubber skin and a non-skid surface which makes it the ideal table for easy cleaning. The table comes with an all-steel frame and base. The hydraulic pump is considered to be of high standard, strong, and heavy-duty. The adjustable arm is also made from stainless steel. This hydraulic table made by Flying Pig is fit for heavy work and built for consistency. As an additional upside feature, the buyer receives a two-year warranty on the frame in addition to a 1-year warranty on the hydraulic pump. The loop, four-legged levelers, and the adjustable hanging arm come included with the purchase of the table. The Flying Pig grooming table is designed for pets of all sizes and weight, up to 220 pounds. The design allows groomers to freely move about with easier access to the animals along with reducing the need to bend and kneel. The Z-shaped frame and H-shaped base gives the table the additional sturdiness and prevents it from shaking or wobbling. Based on the few reviews this table received, users tend to appreciate how easy it is to assemble and providing just enough low level for dogs to hop on before lifting. — Best Affordable Hydraulic Table! The Vevor Z-Lift is a unique looking professional hydraulic dog grooming table you can’t go without. Not to mention, it’s one of the most affordable dog grooming tables on the market right now. It has an adjustable height with a range of 21.3 inches to 36.2 inches. The adjustable arm has a height of 31 inches. 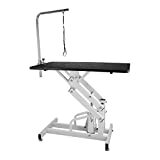 The Vevor Z-Lift exhibits an iron frame with a stainless-steel arm and premium aluminum alloy and can hold up to 220 lbs. The Z-Lift is rightfully named for its Z-styled body lift while its H-base provides the table with optimum stability. The hydraulic system, as opposed to its electric rival, allows for easy lifting of your dog to its height for any activity including professional grooming, bathing, trimming or drying. The black rubber top of the table is skid-proof for astounding traction and ensuring supreme safety for your pets. Designed for both home and professional business use, you can easily detach the table for simpler convenience and better accommodating storage. The static-free table board provides resistance to skidding which also makes it easier to clean allowing for debris and dog hair to easily be wiped down. The arm also is equipped with a leash holder. Users who have bought the Vevor Z-Lift say the delivery in two separate boxes makes it convenient for assembly and that they enjoy the leash holder feature. Most say the quality is great, however, the table is not quite tall enough for certain dogs and professional owners alike. Although quite sturdy according to reviews, some have complained that it easily bends with larger dogs. — Ideal Hydraulic Grooming Table For Home Use! The iKayaa dog grooming table is another top favorite of users. This table seems to inherit quite a few of its perks from previous brands but still keeps its unique style to a modest minimum. Selling at a lower price than most of its competition, with the iKayaa table, you get a cost-efficient heavy-duty grooming table that measures at 36 inches with some additional features. The metal base is made with a fine powder coat and is designed to prevent rusting. iKayaa is built to last with optimum stability. The foot-activated hydraulic pump is made with safety in mind, including its own sturdy pedal for lifting at a 12 cm height adjustment. The swivel-designed tabletop spins at a 360-degree turn and can even be locked in any desired position for that extra kick of convenience and professional efficiency. For physical safety concerns and maximum accommodation for the user, the iKayaa hydraulic table prevents you from overworking and stressing your body with bending over or kneeling. The anti-slide ribbed surface is made to prevent slippage to allow easy bathing, drying, and trimming of your pet without the hassles. It comes equipped with a stainless-steel arm that clamps on which reaches a maximum adjustable height of 100 cm and a 50 cm in length nylon strap for easy pet fastening. According to users, the iKayaa hydraulic grooming table has proved to be a smart buy for personal home use. Dog owners who don’t intend to spend too much money at a professional groomer have had optimal results with the iKayaa at home. As long as the leg supports are kept fully extended, the table seems to be quite sturdy for most buyers. However, the clasps are known to wear out over time.